Connecting OTAs to your Channel Manager has never easier! Enter section CHANNEL MANAGER, then click Edit on the website you want to connect (image 1). Insert OTA credentials in section ACCOUNT, then click on Save (image 2). the left column is the list of rooms created on Octorate, on the right you have the rooms imported from the OTA (image 3). On the left column, click on each Octorate room you want to connect. They will appear at the center of the screen (image 4). Follow the same procedure for the right column (image 5). 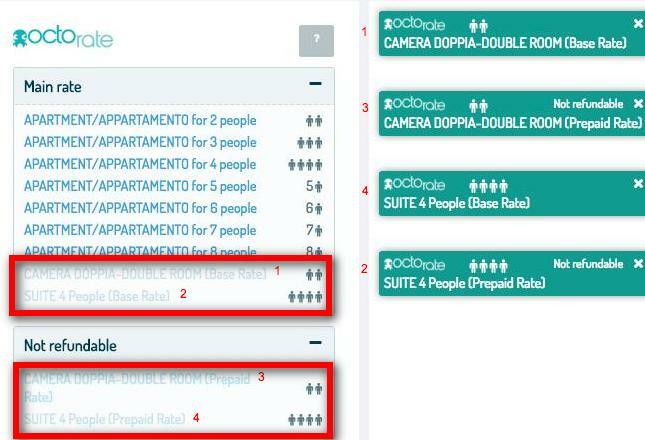 At the center of the screen, you will see the rooms selected from Octorate and from the OTA. Look closely at the two little squares in image 6: click on the left square pressing the mouse left button, then drag the mouse to the other square. You have just connected Octorate room with its equivalent on the OTA. Now repeat the process for all the rooms you want to connect. You just mapped the OTA to your Channel Manager, well done! IMPORTANT! Don’t forget to launch a full synchronization in order to align the inventory between Channel Manager and OTA.